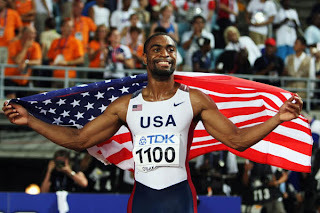 Tyson Gay, who recently produced two stunning performances, despite being bothered by a groin injury, believes he can go faster once he returns to full fitness. Gay set an American record of 9.71seconds when finishing second to Usain Bolt in a world record race in Berlin in August, before returning to lower his mark at the Shanghai Grand Prix earlier a week ago. Those two performances has been encouraging for the American and he is already looking forward to racing next season when he is at full strength. "The races in both Shanghai and Berlin show me that I can and will get faster," an optimistic Gay told reporters, following his win in Daegu, South Korea on Friday. "I know I can go faster. I just need to get healthy, get rested and then get back to work." The 27-year-old was not keen on saying he would have beaten Bolt had he not been bothered by the injury, but the American believes he could have gone faster than 9.69s. "Tough to say (if I could have run faster) and probably it isn’t worth trying to guess," Gay said. "But I do think I could have run faster than 9.69." Gay, who won all but one race in the head-to-head clash with rival Asafa Powell this season and suffered defeat in his only clash with Bolt this year, may require surgery on the groin in the off season and he said he was constantly under pressure with the Jamaicans around him. "Constant soreness is tough to get used to mentally … especially when you have guys like Usain and Asafa on either side of you," he said, adding that he will get a second opinion before finalizing whether to surgery. "The doctors I’ve seen say I need surgery to get rid of the pain," he said. "But I will confirm this with another doctor’s opinion when I get home." Gay closed his season with a 9.94s winning performance at the Daegu Pre-Championships Meeting on Friday to cement his dominance over Powell, the former world record holder when the mark was at 9.74s. Powell has since improved his personal best to 9.72, but only after Bolt lowered the record to 9.69.